Stayed Mar/Apr 13 We very much enjoyed our stay at the villa in Bophut. The villa was well appointed, views were spectacular, the location was good, the pool was large and refreshing and the housekeepers Star and Levy made us very welcome and looked after us incredibly well. We're just sorry that we had to come back to the cold. 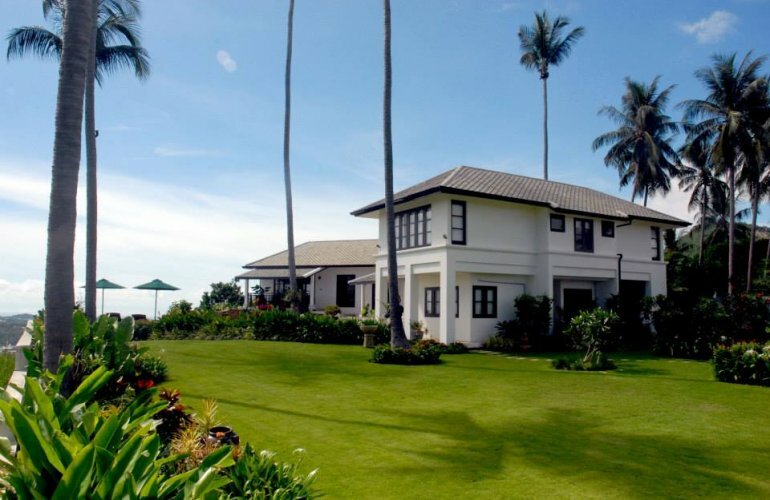 This luxurious villa sits on the hillside of the northeast coast of Ko Samui, and is ideal for a young family, with a large lawn for playtime, a stupendous infinity edge pool with an American safety system, and in-house baby equipment. Close to the International Airport, fascinating Fisherman?s Village and also the Santiburi Golf Club - the location is perfect. Set inside a private walled garden featuring a huge 1600 sq meter lawn, this beautiful two storey holiday home offers guests a sophisticated tropical haven that blends modern functionality with traditional design and style. Located in Bophut Hill to take full advantage of the glorious views over Bophut and Big Buddha Bays and out to Koh Phangan. It is a 15 minute drive to the island's main tourist centre of Chaweng, with its night spots, restaurants and beaches, and to the airport. Fisherman's Village is just 5 minutes away, and here too are many interesting shops and cosmopolitan restaurants and bars. As you enter the garden and gaze around at the lush tropical foliage it is so tranquil and peaceful you could almost ignore the breath taking views over to the ocean. The villa is very private, and its spacious, bright rooms and the extensive outdoor decking begs all guests to unwind, relax and enjoy. But if you need to keep in touch or check your emails, complimentary broadband Internet access is provided. All three bedrooms have air conditioning, a personal safe, and a TV/DVD system. There is a ceiling fan in the living room. The open plan living area is large and airy, with light streaming in from windows on both sides. There is a large wood dining table for six and a comfortable sofa. There is a profusion of traditional Thai furniture and floor and wall accessories, all making for a very home-from-home atmosphere. The large glass doors on one side open out onto a surrounding covered verandah, which runs along to the second private verandah of the master bedroom. A fully equipped and western-style kitchen is in this main living area too, but is separated from the living room by an elegant black and highly polished stone breakfast bar, with bar stools. Perfect for any early risers to grab their first cup of coffee of the day! The master bedroom suite is situated just to the side of the main reception room, and has direct access to the pool and terraces. It has a king size bed, a day bed and a large dressing room with built-in wardrobes. The magnificent marble bathroom features a Jacuzzi tub, twin hand basins and a shower. An open-tread staircase from the reception room leads up to the other two bedrooms. One bedroom suite has twin beds and the other a king size bed. These two bedrooms share an interconnecting bathroom, which has twin hand basins, a sunken mosaic tub & separate shower. Both bedrooms enjoy fabulous views to Bophut Bay and Big Buddha Bay.